Close photograph of the base of the south shrine of a temple at Balsane, taken by Henry Cousens in the 1880s-90s. This temple is one of nine built at Balsane in the eleventh and twelfth centuries. 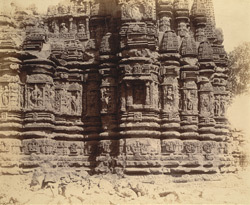 The majority were constructed in the Yadava Deccan style of architecture, the example depicted in this photograph included. Dedicated to Shiva, the temple incorporates three shrines, arranged around a central mandapa, or porch. It is the only temple at Balsane with a shikhara, or tower, which is still standing over a shrine. The tower incorporates a small upper chamber, the design of which bears affinities to temples built at Konch near Tikari and at Bodh Gaya. The outside of the tower is adorned with projections, a theme which is continued on the temple's outer walls, depicted here, which are also adorned with deeply cut basement mouldings. The sculpture panels set in the niches have been badly damaged.